I’ve been back to Australia from Tokyo for two days already, still feeling tired, yet really relaxed for the past week in Tokyo Japan. We stayed in a 4 stars hotel in Ikebukuro, a very convenient district to go for shopping and sightseeing. Needless to say, we enjoyed lots of yummy, authentic foods at different local restaurants. This was my first trip in Japan. Had we not guided by Leon, we couldn’t have enjoyed so much in this trip. Most importantly, the precious time being together with my family in this trip is what I treasured the most. Tokyo is an amazing, busy and crowded city. Before traveling to Tokyo, some of my friends kept telling me that the cost of living in Tokyo is very expensive due to high living standard. After this trip, I found eating in Tokyo is not expensive after all. Not only Tokyo is a fantastic city where you can taste a variety of gourmet foods within a tight budget, but also a memorable place to indulge yourself at any expense if you like. 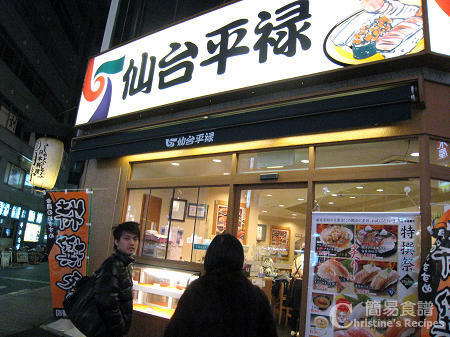 We tasted fresh salmon rice at this little shop, 若狭家 in Shinjuku that was packed with local customers. Ramen can’t be missed on our list of Japanese food adventure, of course. We ate some at Kaminarimon, Asakusa (雷門). Sorry, I was too hungry and forgot to take photos. As for this cozy restaurant specialized in cooking handmade fresh noodle soup, Ichiran Ramen (一蘭拉麵), it would be a shame if I forgot to mention. Take a look at their unique design of seats for customers. 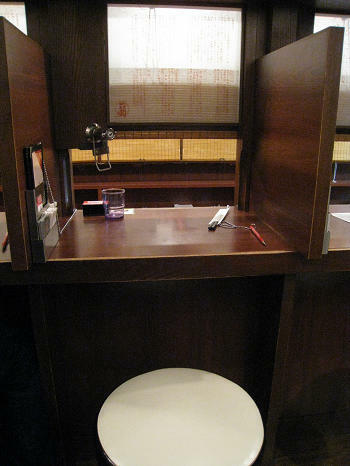 The solitary seat design is quite-new to me, each one separated on each side, like tiny library booths. 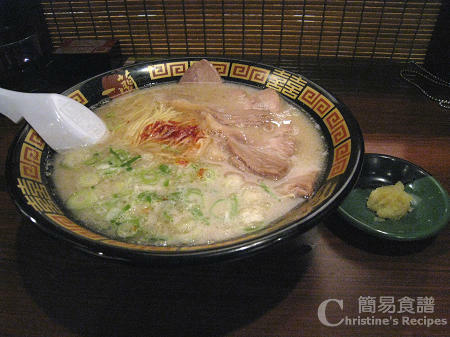 Every single customer has his/her own place to enjoy their own customized ramen. I guess their unique design is to make every customer feel comfortable and focus on the flavours of their ordered ramen without any distraction. It’s so quiet inside Ichiran. I hardly heard of any chatting at all, except the sound of slurping my delicious soup. In front of every seat, there’s a little description about how they run their business. They inherit their ancestors’ secrets to make fresh noodles by themselves, that you can’t find anywhere else. The noodles that we ordered were tasty, absorbed all the flavours of meat and spices, going exactly right to the milky soup. 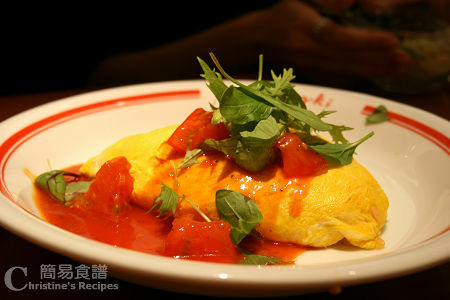 The other day, we went to Pomme-no-ki at Aqua City (5/Fl., Odaiba's Aqua City Shopping Mall) to try their omurice. Omurice (fried rice wrapped in omelet) is a contemporary Japanese dish consisting of smooth and silky fried egg that wraps fried rice inside. Leon guided us to this specialty shop that offers a variety of omurice, tops with different creamy sauce chosen by customers from their menu. How can we miss sushi? 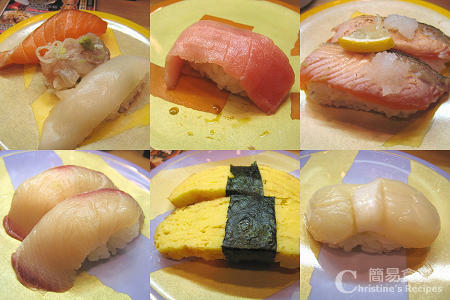 Yes, we tasted lots of sushi in Tokyo. Here I took some pictures from 仙台平祿 in Ikebukuro. We ate a lot. Fortunately, we walked a lot and did enough walking exercise too. Overall, the trip in Tokyo was very fruitful and enjoyable, shopping with satisfactions, sightseeing with much fun, and meeting many polite strangers on streets with surprise. Hopefully, I would travel to other cities in Japan some time in the future to experience more and enjoy more. The sushi rice looks amazing! Would love to visit Tokyo one day! Glad to see you are back! We missed ya! Everything looks delicious - especially that big bowl of salmon sashimi. I like the library booth concept ramen store but what if some people go as a family and have toddlers? Don't they have larger tables for everyone to sit around together??? Oh! What a beautiful and amazing dinner. I love thse pictures! Well done! Great! 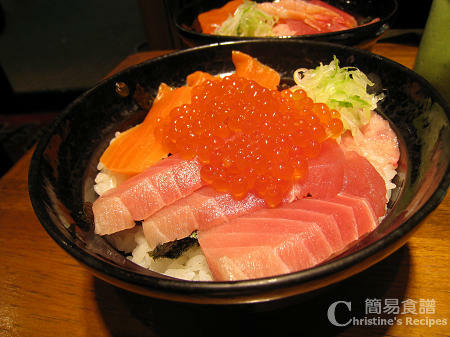 I'm craving for sashimi. Is that masago? Ikebukuro is a very convenient spot. We also stayed there last time when we were in Tokyo. I believe you must miss Tokyo. Glad to hear you had a wonderful time! Did you go to Tokyu Hands in Ikebukuro? My Tokyo Stories post has just gone up, see if we did the same things! Tokyo is a very good city to visit. You’d love it. Thanks so much. Miss you all too. I felt a bit tired and busy of catching up things here. I raised the same question as yours at the time I went into that restaurant. It seems that they don’t focus their business on families with toddlers. Well, a family like us with grown-ups has got no problem. Thanks for your comment. I love those pics too. I’ve no idea of whether it’s masago or not. Hehe…. Exactly, I miss the trip with my whole family together. I did go to Tokyu Hands in Ikebukuro and spent two hours or so there, bought some bakery utensils. I’ll check out your post. It must be very informative as usual. Enjoy reading your blog. I love Tokyo and you brought back all the great memories. I am so happy you really enjoyed yourself. It was such an exotic and foreign experience for me, it was my first trip abroad and we had no idea what to expect. 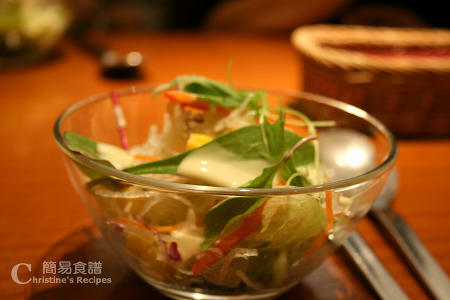 I always find Japanese food utterly fascinating and captivating, both in look and tastes. They are always so neat & well presented. Love every dish here. Wonderful to know you had a great time, esp with your family. Would you go back and travel again? I wish I could. 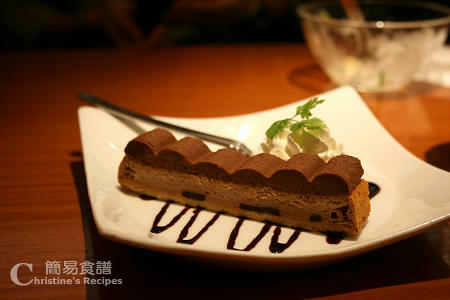 Japanese cuisine can be classified as food arts par excellence. Oh... I love ramen right now. I am in search for the best Ramen in Melbourne. Everything looks so fresh and inviting! Nice to hear you have enjoyed your trip in Toyko. I also want to go too but now living in Switzerland is not so easy to go compared to when i was still living in HK and when I am back in HK, I could not make time. What a "foodful" trip! Your photos (esp the first one) make me craving for Japanese food now.